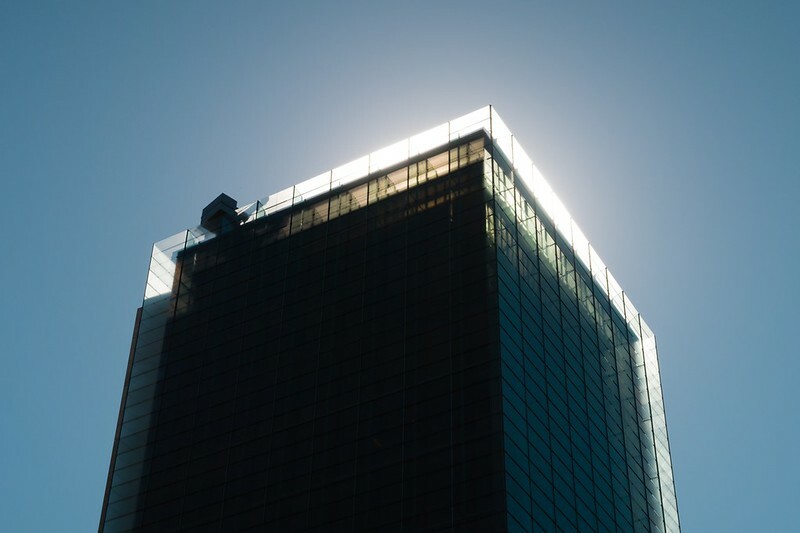 This year’s release of Michael Sorkin’s latest collection of critical essays, What Goes Up: The Rights and Wrongs to the City, prompted me to put together a “learn about” post on the influential critic, educator, and designer of buildings and cities. An outspoken critic of misguided architecture, urban inequality, oppressive ideologies, and other impediments to truly egalitarian and sustainable societies, Sorkin is principal of Michael Sorkin Studio, president of the non-profit Terreform, and director of the Graduate Program in Urban Design at City College of New York (CCNY). Need a Sorkin primer? This 2010 interview on CUNY TV, at the time of Twenty Minutes in Manhattan, is a good start. Considering how much Sorkin has written, I’ve categorized his print output into six categories: criticism, design, New York City, editing, education, and UR (Urban Research). All titles are authored or edited by Sorkin, unless noted otherwise. Full disclosure: I attended the Urban Design Program at CCNY under Sorkin (2006-07) and have helped him with UR. This title is the fourth collection of Sorkin’s critical essays, covering the years 2010 to 2017. Many of the pieces come from The Nation, where he served as Architecture Critic from 2013 to 2016. Still, not quite half of the 48 essays originated there, meaning a mix of lectures, articles for other publications, book excerpts, and a few unpublished pieces fill the rest of the pages. Not surprisingly, the majority focuses on New York City, with the rest covering “Elsewhere and Otherwise.” Only one essay is dated after Donald Trump’s election win, and it doesn’t even broach that elephant in the room; thankfully, Sorkin’s introduction takes on Trump, albeit briefly. It’s hard to believe that the predecessor to What Goes Up was released seven years ago; it seems like just the other day that I wrote my review. All Over the Map packs in 76 essays (nearly twice as many as the new collection) that fall between 2000 and early 2011. Most were culled from Sorkin’s Commentary columns in Architectural Record. I read those on a nearly monthly basis, given my subscription to the magazine, so I ended up gravitating to the articles from other publications. Given the timing of the book, September 11 and the responses of the 2001 terrorist attacks shaped the content of Sorkin’s essays — but not his progressive takes on architecture, cities, culture, politics, and society. Continuing backward in time, the second installment of Sorkin’s criticism covers the years 1995 to 1999. Most of the 36 essays were pulled from two sources: Architectural Record and Metropolis. At only around 250 pages, it is the shortest of the four collection of Sorkin’s criticism, though with great essays such as “Eleven Tasks for Urban Design,” first published in Yale’s Perspecta, quantity here is not an indicator of quality. Which brings us to the one that begat the rest: the compendium of Sorkin’s articles from his ten-year tenure (1978-88) at New York’s Village Voice. The paper, which halted print publication last year and then sadly ceased publication entirely a couple months ago, was the ideal pulpit for Sorkin’s progressive views. He could rail against Philip Johnson and other overrated architects, draw attention to ones he liked but were otherwise little known, and proffer alternative points of view on important developments in New York City. Although the book is subtitled “Writings on Buildings,” it’s clear that Sorkin was already focused as much on cities as on the buildings filling them. Four years before PA22, Sorkin put out a monograph emblazoned with, not one of his projects, but a cluster (army?) of frogs. The cover image and the book’s title, Wiggle, certainly aren’t at odds with each other, but it’s clear to me that idea trumps image, particularly when compared to other architecture monographs. What those ideas or visions are is not spelled out in an essay; instead the projects — with some short but honest and helpful explanatory text — speak for themselves. They range from small exhibitions to city plans. Tying them together are Sorkin’s distinctive “wiggly” designs and his beautiful (and underappreciated, I think) drawings. Most striking are the plans, which are dense with lines, have nary a right angle, and give the impression that social life would be much more intimate if we lived in Sorkin World. It’s hardly a surprise that the New York-based Sorkin has dedicated hundreds of thousands of words to his home city. The best of his NYC books uses his short walk from home to office, both in Lower Manhattan, as a starting point for expounding on myriad things about cities in general, NYC in particular. As I wrote in my review in The Architect’s Newspaper back in 2010: “Each realm of social interaction [in the walk] is a looping mix of descriptions, recollections, histories, critiques, and explications, with the tangential offshoots always returning to the walk, as if to acknowledge and elevate the importance of the individual’s experience in the city, both physically and mentally.” Although much of the content was pulled from Voice and Record over a period of more than a decade, it reads as a fluid narrative rather than essays disconnected in time and setting. Before Sorkin assembled critiques and designs into Starting from Zero, he teamed up with fellow CUNY (CCNY is part of the City University) professor Sharon Zukin. The urbanist and sociologist together are, in my mind at least, a heavenly match; I absorb and enjoy Zukin’s book as much as I do Sorkin’s. The two co-authored the introduction, but after that they express their own takes on post-9/11 New York City alongside a slew of other great minds: Marshall Berman, M. Christine Boyer, Keller Easterling, David Harvey, Neil Smith, and Mike Wallace, among many others. I didn’t pick up this book until last year, much too long after its publication to have enthusiasm for the topic; like other New Yorkers, I’ve moved on, swept along by the city’s Bloomberg-era transformations. 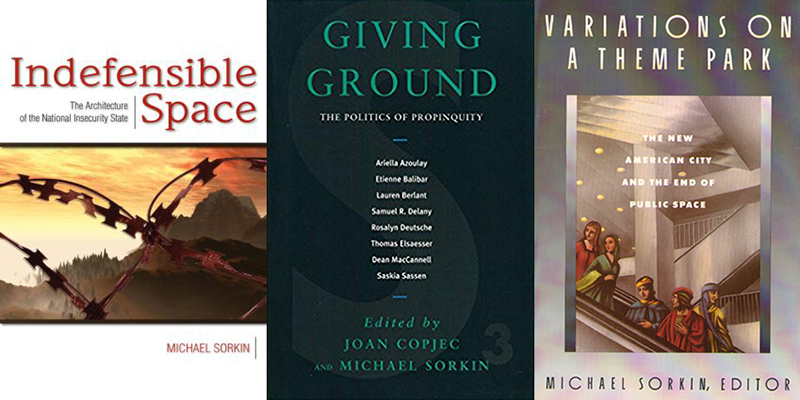 Although he edited this book with his wife, Sorkin’s only contribution is the introduction, while Copjec pens one of the nine essays that follow it. Perhaps stemming from the two minds at editorial work, the book’s theme is a bit more obscure and unclear than the titles above and below it; in turn, it’s not as rewarding to me as other Sorkin titles. My favorite essay is Dean MacCannell’s “‘New Urbanism’ and Its Discontents,” which tackles a movement I love to hate. Like Exquisite Corpse, this book is classic Sorkin. It’s a timely and influential collection of essays on a well-honed topic: critiquing the urbanism of the late 1980s and early 1990s that was marked by “megamalls, corporate enclaves, gentrified zones, and pseudo-historic marketplaces.” Sorkin penned the introduction and the memorable essay “See You in Disneyland,” which is accompanied by a photo of the sky above the theme park, given Disney’s “litigiousness” and therefore difficulty in taking photos for publication inside. He’s joined by names that would become usual suspects in his growing sphere of publications: M. Christine Boyer, Mike Davis, and Neil Smith, to name just three. At more than 35 years old, the book is ripe for an update — or maybe a 21st-century remake, where Boyer’s analysis of South Street Seaport, for instance, morphs with its rebranding as Seaport District and “pseudo-historic marketplaces” give way to glass-box marketplaces. Sorkin’s role at CCNY has led to some books coming out of the Urban Design program, including one on the year I attended. My classmates and I spent two semesters focused on creating a sustainable, post-oil master plan for Lago Agrio, the oil boomtown in Ecuador’s rainforest. (My photos from a trip there in November 2006 were posted to this blog.) The project also roped in some architecture and landscape architecture students, and the book documents all of our contributions and includes some additional materials, including an article from The New Yorker on the drawn-out lawsuit against Chevron. Although the book, as most do, took much longer than anticipated, I’m glad to have such a nice documentation of close to a year of hard work — and fun. Sorkin is Vice-President of the Urban Design Forum, the “independent membership organization that advances bold solutions to urban challenges.” It was formed a few years ago from a merger of the Forum for Urban Design and the Institute for Urban Design; Sorkin served as President of the latter, which was founded in 1979 by Ann Ferebee. In November 2007, the Institute hosted New York 2030, a day-long symposium that dissected Mayor Bloomberg’s PlaNYC, “an ambitious project to turn New York into the world’s most sustainable metropolis.” Out of that event came this slim, 72-page book, with far-too-short contributions by Sorkin, Marshall Berman, Teddy Cruz, Richard Sennett, Sharon Zukin, and many more. Running along the bottom of each page, like a ticker, are the 127 initiatives of PlaNYC, most too broad or ambitious to be realized or even considered in the ensuing eleven years. If I didn’t come across this book while digging through the shelves of a local bookstore, I wouldn’t have known anything about it. I was intrigued because of Sorkin’s role, but also because my wife spent a semester at the Aarhus School of Architecture. The Sorkin Workshop of the book’s title was carried out across one week in October 2005, aimed at envisioning possibilities for Aarhus Harbor, the potential setting for the school’s new building. (Twelve years later, the school selected a scheme in a competition [PDF link] for a new building in Godsbanearealerne, in the heart of Aarhus.) I’ve misplaced this pocket-sized book, but I recall the workshop paralleling the exquisite-corpse format that Sorkin taught us at CCNY, in which individuals create plots but then modify them based on a series of transformations. The result is a plan created by a variety of designers following certain rules and negotiating with each other along the way. 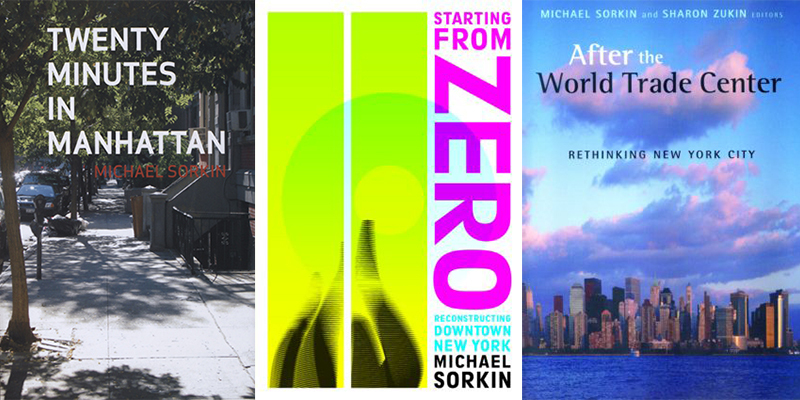 UR (Urban Research), the publishing imprint of Sorkin’s non-profit Terreform, was launched in 2016 as “a book series devoted to cities and their futures.” There are a dozen titles to date (six are pictured here), including one on the late, great Marshall Berman and three on various aspects of New York City. I’m familiar with the two titles highlighted below. Although Downward Spiral was not published in time for the companion 2017 exhibition, El Helicoide: From Mall to Prison, at the Center for Architecture in New York, the book does not disappoint. In my review from earlier this year, I describe the book as “the definitive cultural history of El Helicoide,” a spiraling inside-out mall built atop a hilltop in Caracas. Following from the diminutive exhibition’s numerous artifacts, the book tells the historical story of the building, which would have enabled people to drive up to the store they wanted to patronize, but also its later use by the police as a prison. It’s a perfect subject for UR: politically charged and fairly obscure beyond its local context — and therefore in need of a wider audience. This is the book I’m reading right now (a full review is forthcoming): a collection of letters and other essays by Kongjian Yu, founder of Turenscape. These texts were, as far as I know, only available in Chinese beforehand, and some weren’t published until Letters to the Leaders of China. Accompanying Yu’s texts are critical essays by a half-dozen scholars and a great, rambling interview (the first thing I read) between Yu and artist Ai Weiwei. 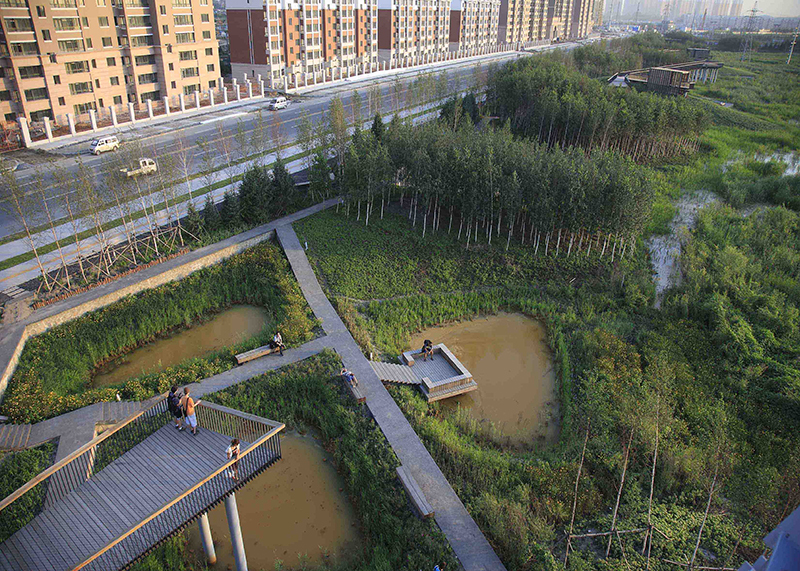 Those looking for pretty pictures of Yu’s amazing “sponge cities” and other landscape projects will be disappointed, but those familiar with Turenscape should be pleased with some insightful background on what led to their thousands of groundbreaking designs all over China. 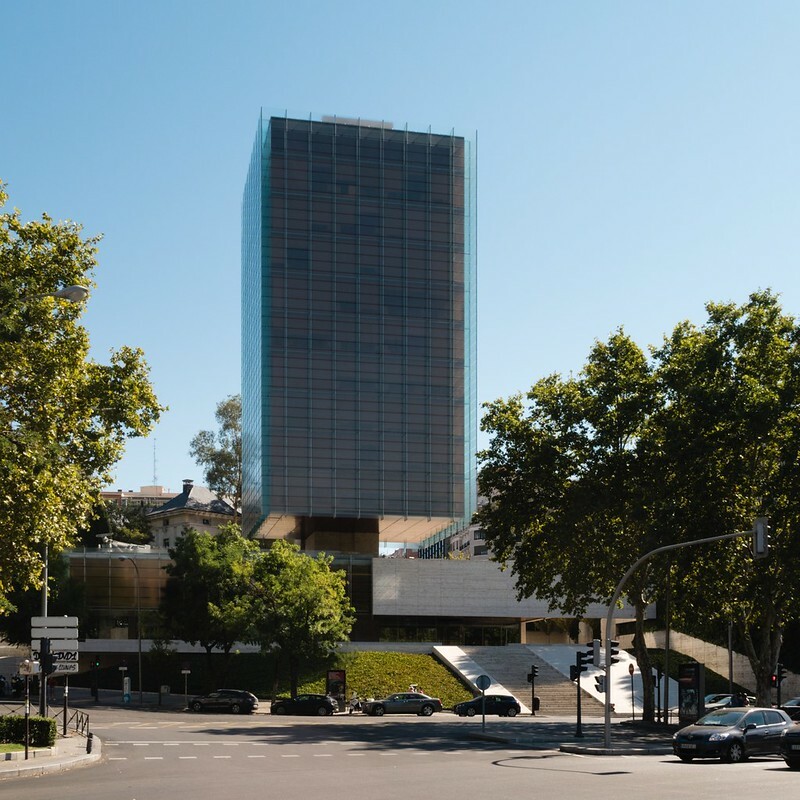 Five years ago, coinciding with a couple conferences on architectural exhibitions, I did a short survey of venues devoted to architecture for World-Architects. With only eleven institutions, the survey was far from comprehensive, though it made up for this with a diversity of locales and approaches to displaying architecture. One of the youngest – two years old at the time of publication – of the bunch was LIGA, Space for Architecture in Mexico City, which I had only marginal knowledge of at the time. 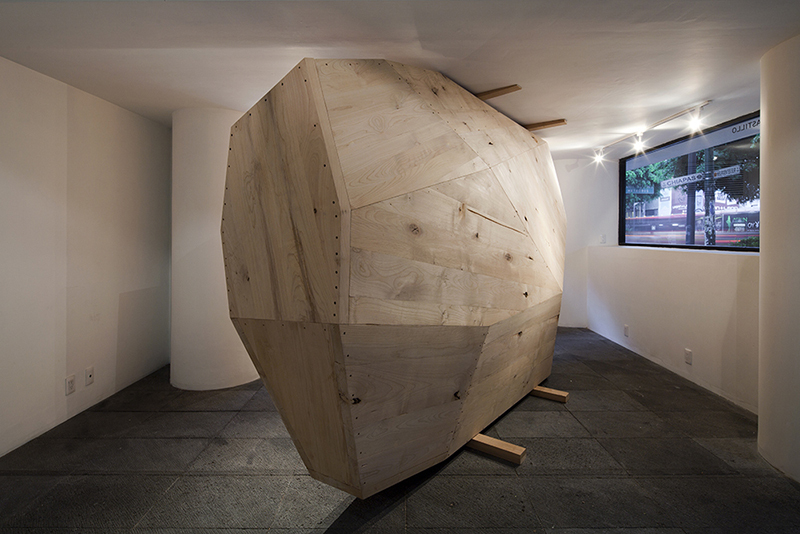 An “uneven balance between lots of construction and no discussion” in Latin America led to the creation of LIGA and made it “a necessary platform to create a local architectural culture.” Amazingly, the ambitious impetus of LIGA and its diverse seasonal programming (four exhibitions per year) took place in a corner storefront of only 160 square meters (photos below, though LIGA’s website hints at an impending move to, I’m assuming, larger digs elsewhere in Mexico City). Exposed Architecture documents three years of exhibitions at LIGA – from LIGA 11 to LIGA 22 (all exhibitions have been prefaced by LIGA and the number of the exhibition) – but does it in a way that is partial yet exploratory. It’s partial, because the critical texts provided in the book are extracts from the longer texts provided at the time of the exhibition and archived on their website (well, hopefully the full archives will be there after LIGA’s new website goes live). The book is exploratory because it is not limited to documentation of the exhibitions; it also includes information on the Interludes, the “series of events which explores specific themes” and take LIGA beyond it’s small 160-square-meter footprint; ten short essay from fellow curators of architecture exhibitions, many outside Mexico; and “an archipelago of historical references” inserted between the three other sections. 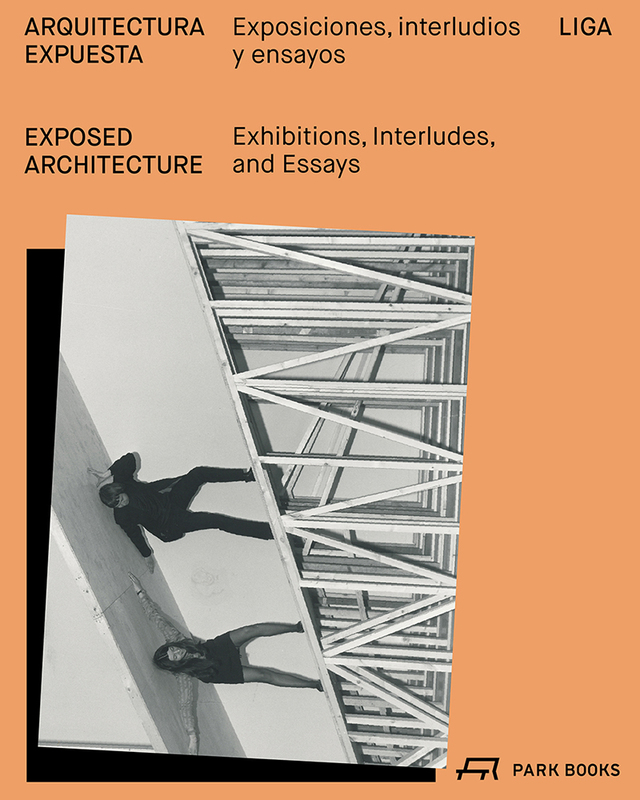 Of Exposing Architecture‘s various parts: the presentations of LIGA 11-22 illustrate just how much the exhibitions rely upon the space of LIGA for their display and impact, thereby making any book documentation only partial; the Interludes make it clear that LIGA is as much about art as architecture (reminding me of New York’s Storefront for Art and Architecture); the essays reveal the complexity of curating architecture exhibitions today, when so much is expected of the many venues for architecture; and the historical references reveal how that complexity is nothing new. Together these parts describe a place, LIGA, that considers the content and display of architecture exhibitions much more than their diminutive footprint would make it seem. 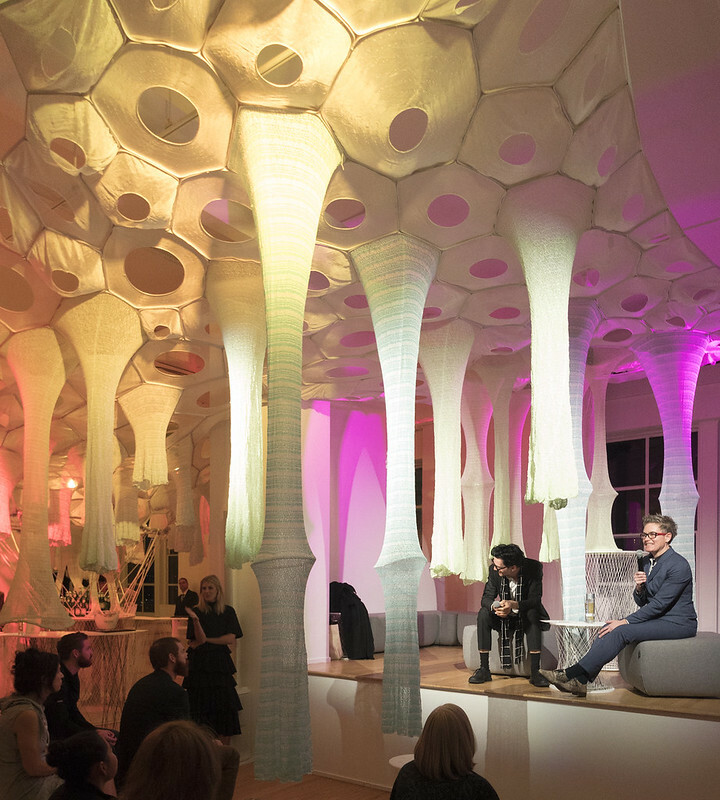 Last night I attended the opening of LUSTER, an installation designed by Jenny Sabin Studio and curated by Art Production Fund for House of Peroni. 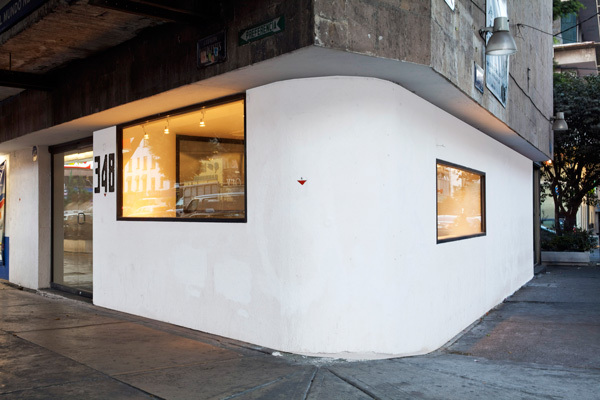 LUSTER transformed the top floor at 463 West Street (part of Westbeth Artist Housing – PDF link) into a pop-up bar for a few days, after which the piece will travel to LA, Miami, and DC this fall. Before the party got going Jenny Sabin spoke with Christoph a. Kumpusch about the installation and the work of her studio based in Ithaca. 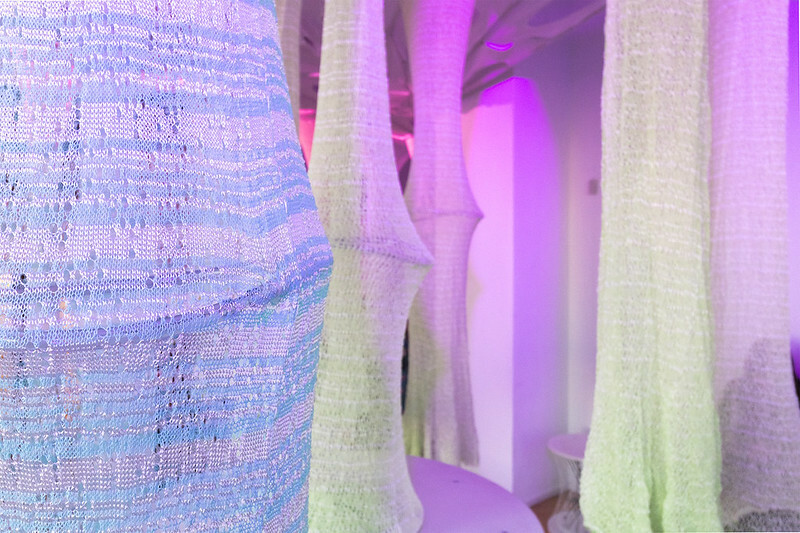 Sabin’s work came to my attention, like most people I’m guessing, when she won the MoMA PS1 YAP last year with Lumen, a lightweight canopy of digitally knitted, robotically woven, photo-luminescent, solar-active yarns. Unfortunately, I only saw Lumen during the day, not at night when it glowed in various colors. Thankfully, last night’s discussion took place just after sunset, when LUSTER‘s color-changing lighting kicked in, distracting me from whatever Sabin and Kumpusch were saying. See the roughly one-hour color-transformation in the slideshow below. 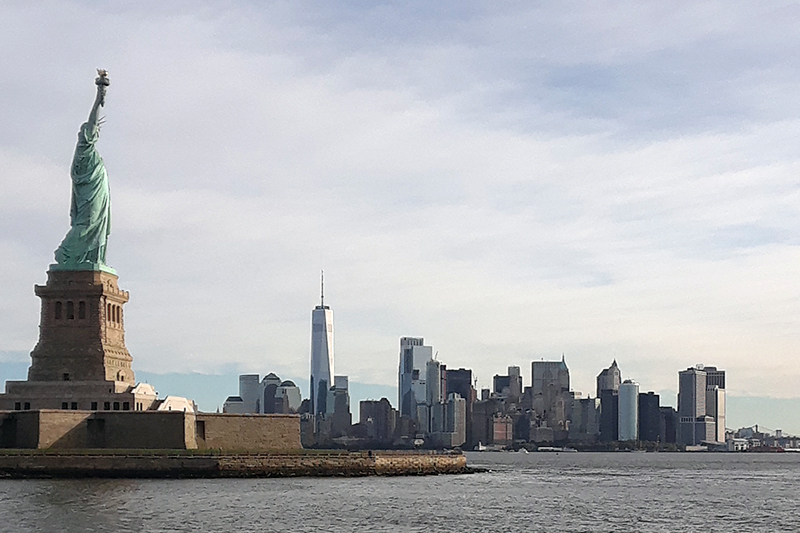 Twelve years I’ve lived in New York City and Wednesday morning was my first visit to Liberty Island, home to the most famous statue in the world. I didn’t go to walk up the 350-plus steps to the crown of the Statue of Liberty though. 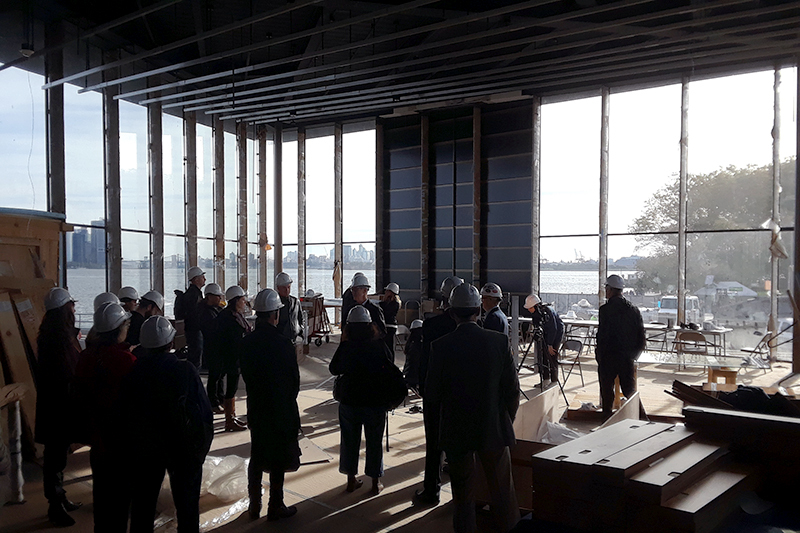 I was there for a hard hat tour of the Statue of Liberty Museum. Designed by FXCollaborative, with exhibitions by ESI Design, the building is expected to open in May 2019. The current museum is housed in the base of the Statue of Liberty at the eastern end of the island. This location means that many people don’t visit the museum, since thousands more people take a ferry to the island than get inside the statue’s base. The new freestanding museum, located next to the existing Flagpole Plaza on the western end of the island, will enable more people to visit the museum and it should alleviate congestion on the island. 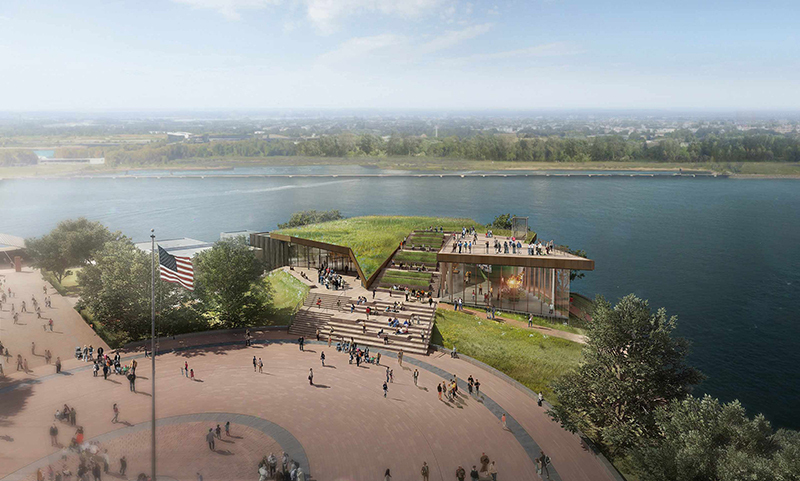 Its galleries will have three main parts (Immersive Theater, Engagement Gallery, and Inspiration Gallery) to tell the story of the Statue of Liberty, but I’m guessing most people who head inside will do so to see the original torch (visible in the rendering above); it was replaced in the 1980s when the statue was restored for its centennial. 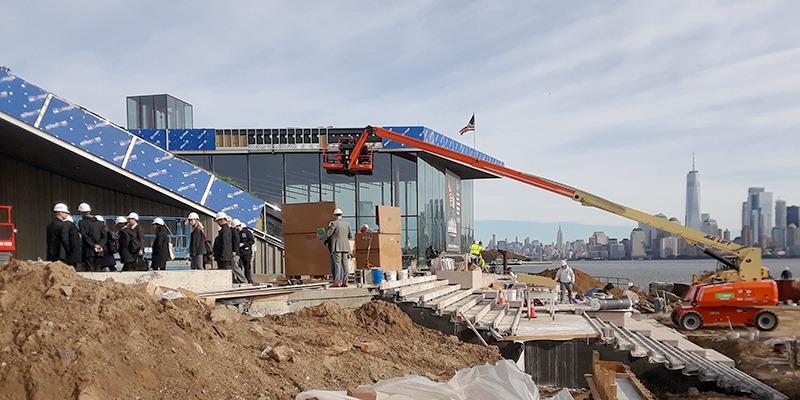 The one-story building – elevated for post-Sandy FEMA requirements – is basically an irregular trapezoid that is cut at an angle by exterior steps that span from the plaza to the roof of the museum. Halfway up the granite steps is a walkway that leads to the museum entrance. An accessible route consists of an exterior ramp to the entrance (the vantage point of the photo above) and an elevator accessed from an exterior walkway for going up to the roof. While it was easy to make the leap from construction site to completed building in my mind in regards to the building’s exterior, the same was a bit trickier inside, where tools were much more prevalent than displays, which were basically non-existent. Regardless, the flow of the fairly open interior and three-part exhibition spaces were easy to grasp, starting with the entrance and its patina-green donor walls (above). From there, visitors follow undulating walls to watch projections of short films in the Immersive Theater, then find themselves at an exhibit of artifacts before ending up at the torch. ESI’s design will tell the history of the statue but also of the idea of liberty, bringing it to the present through an interactive gallery beneath the exterior steps, where visitors can snap selfies and merge them with selected images that say “liberty” to them. 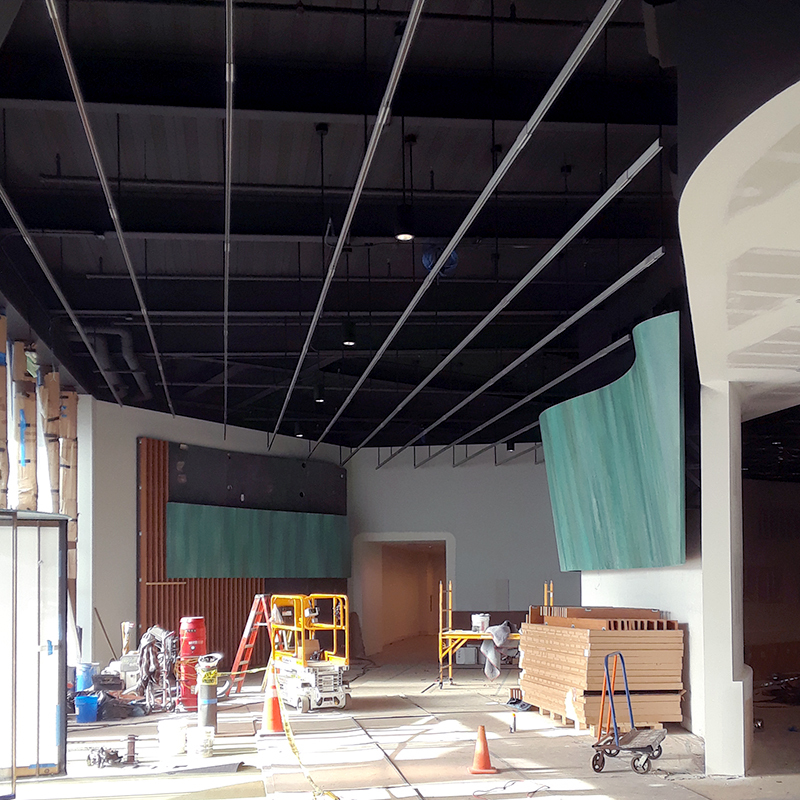 The exhibits’ success will have to wait until May, but suffice to say the museum is aiming to do a heck of a lot in its small, 26,000-sf footprint. The museum’s irregular footprint makes a bit more sense when considered relative to the building’s immediate site and distant views. 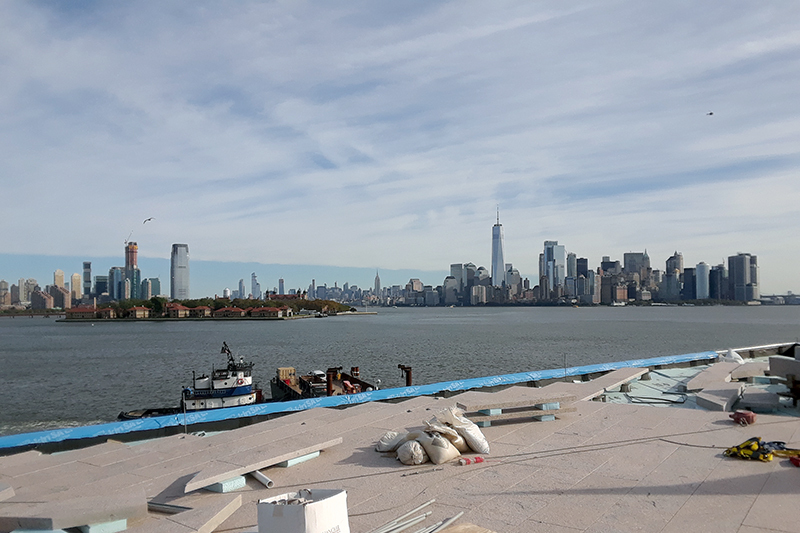 The plan contorts itself into its corner of the island and then opens itself to the east and north toward views of the Statue of Liberty, Lower Manhattan, and Ellis Island. Inside the museum, both views will be taken in from the room housing the original torch. This is partially grasped in the above photo, which is a bit misleading since the opaque panels are temporary (there to allow the torch to be brought into the museum) and will be glazed once the torch is in place. 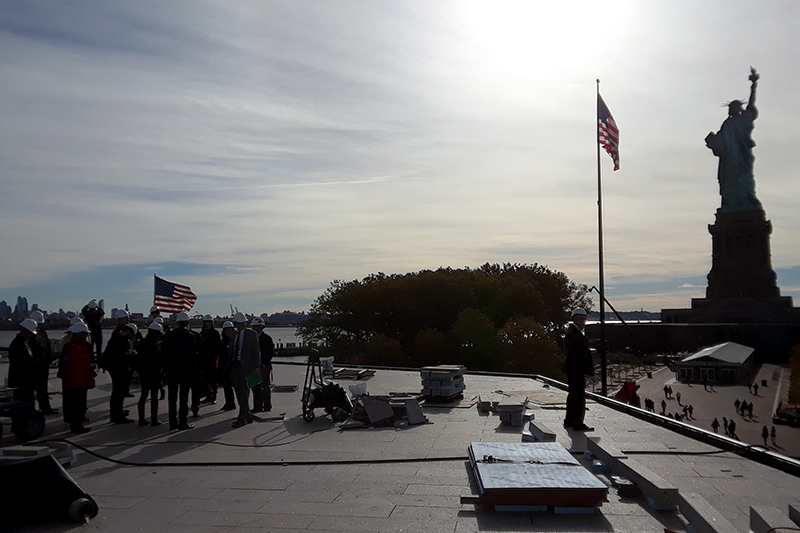 Back outside, the roof of the museum is split into three: the steps in the middle; grass to the south, with views toward New Jersey (photo above); and a paved surface on the north, with it’s panoramic views from the Statue of Liberty to Lower Manhattan and Ellis Island (photos below). 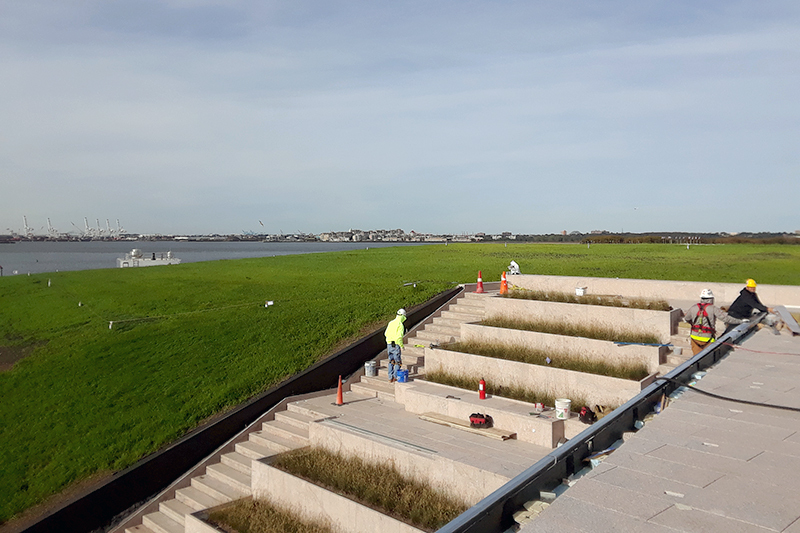 The panoramic views from the roof would lead us to believe the museum has been designed with a prescriptive architectural promenade, but routes through the building are loose and it’s very likely that some visitors will head up to the roof and skip the interior exhibits altogether. Such is liberty today: the freedom to move about the island and museum after going through airport-style security and riding a crowded boat to get there. Although I live in New York City, I haven’t lived here all my life and therefore I like to think I’m more aware of some biases held by New Yorkers. With twelve years now as a NYC resident, following decades in Chicago and half a decade in Kansas, I’ve grown to understand, for instance, why people here are so focused on the city, as if blinders shut out the world – or at least parts not deemed worthwhile – beyond the shores of the five boroughs. Not as cliché or hyperbolic is the way the media in NYC shapes issues well beyond the city, something natives might not be so aware of. Take gentrification, a very real issue for residents of lower-income neighborhoods that witness rezonings, public works improvements, widespread development, and then displacement. With rising rents, stagnant wages for working classes, and rising inequality, gentrification is eating into New York City’s supply of affordable housing and turning parts of the city into rich enclaves lacking in diversity. But outside of NYC, San Francisco, and a few other large metropolitan centers in the US, is gentrification that big of an issue? Not according to Alan Mallach, author of The Divided City. Mallach, a planner, advocate, writer and educator based in Washington, DC, believes that smaller, postindustrial cities such as Detroit, Pittsburgh, and St. Louis have bigger issues to deal with than gentrification. At the top of the list, and the subject of his new book, is the effects of inequality on those in poverty. As the book’s subtitle indicates, Mallach looks at the rich and the poor, in terms of how inequality extends to opportunities for people in life. In other words, those growing up in well-off (mostly white) neighborhoods have access to opportunities to do well in life, but those growing up in struggling (mainly black and Hispanic) neighborhoods don’t have access to the opportunities that would pull them out of poverty. One important assertion stands out in Mallach’s book: economic opportunities are place-based. This statement may seem far from new (just think of “the other side of the tracks” and other embedded “wisdoms”), but it screams for a simple solution: forming ethnically and economically diverse neighborhoods where equal opportunities exist for all residents. Unfortunately, too many ingrained beliefs and myths in the US seem to stand in the way of such a fix. I read The Divided City over the summer, not long after reading Matthew Desmond’s Evicted and right before diving into Richard Rothstein’s The Color of Law. 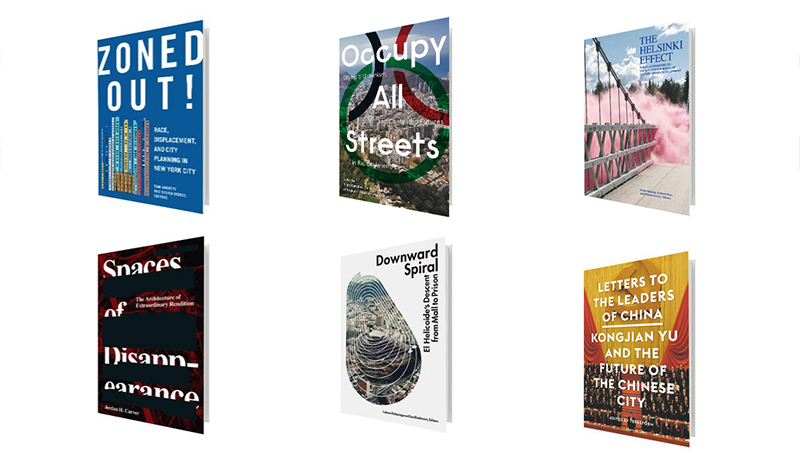 These are all excellent and important books on some of the worst aspects of American cities. Although each ekes out its particular niche in the booming urbanism literature this decade, there is some overlap – to the point that the three blur together in my recollections of them. They share some optimism amidst the gloom, and the authors balance practical visions for change alongside idealized scenarios. Mallach focuses, in part, on the distribution of money, pointing out, in one case, how easy it would be to take the money spent on luring professional sports franchises to postindustrial cities by building expensive stadiums and putting those dollars toward programs that would employ and/or house people in need. 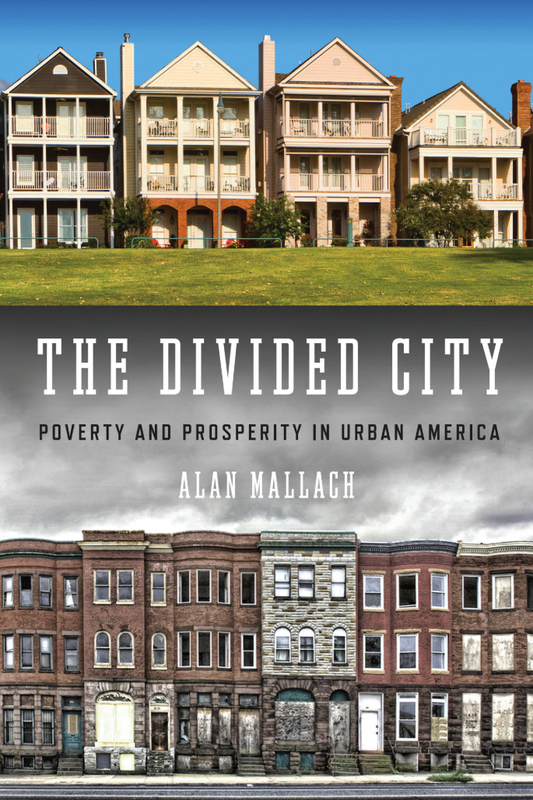 Sure there are plenty of obstacles (racism and the negative view of “handouts” and wealth redistribution today, to name just two), but in these and other scenarios Mallach believes change comes from cities rather than the federal government. 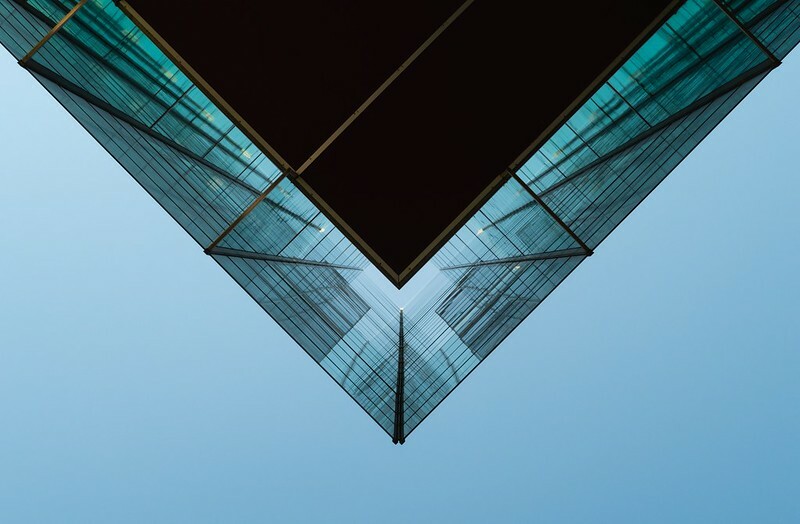 With an emphasis on relatively bottom-up approaches, the change Mallach argues comes across as manageable, if still hard, and is also aligned with his (accurate, I think) take that place is the key to creating equal opportunities for everybody. Also check out the website for QI 2018 (screenshot below). 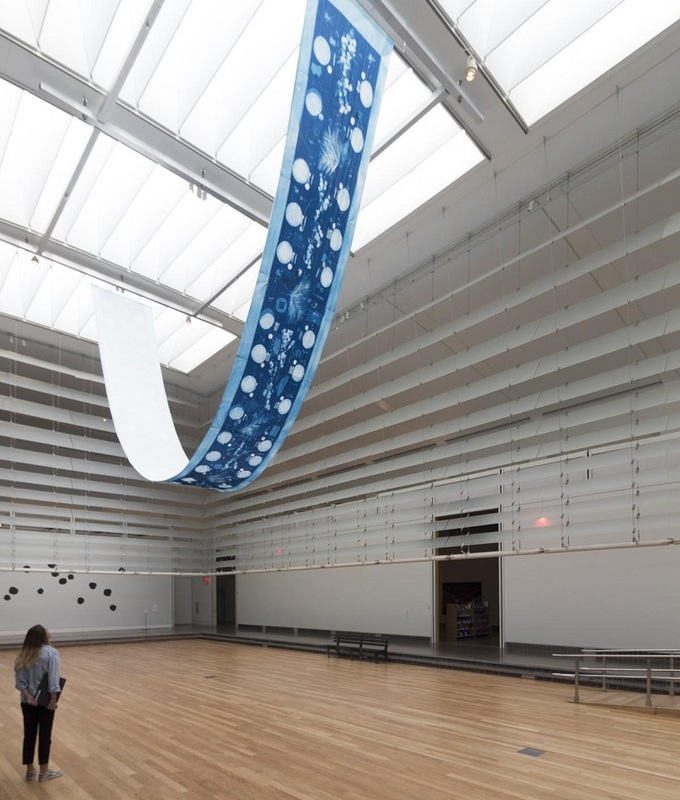 Created by artist Ryan Kuo with Taekeun Kim, the website is structured about the Queens Museum building – built for the 1964 World’s Fair, used briefly for the United Nations, and expanded by Grimshaw in 2013.